My children’s stories have appeared or are upcoming in Cricket, Spider, Ladybug, and Babybug magazines, and my picture book, Reading Beauty, was just released with Pelican Press in February (2018)! I enjoy incorporating past experiences as a teacher and newspaper columnist as well as a rich childhood overseas (Bangladesh and Kenya) into my work for children and also into my essays, poems, and stories, which have appeared in multiple literary journals such as Southeast Review, Louisville Review, and Cold Mountain Review. When I’m not writing, I enjoy leading workshops and giving presentations in Seattle-area schools. We love living, working, hiking, and kayaking in the Pacific Northwest–most often in the rain! Currently, I am finishing work on a humorous middle-grade novel set in a diverse neighborhood that explores the importance of truth, empathy, and friendship. I am also polishing a couple more picture book texts, “Beatrix Brown Wants a Frog” and “Just William.” I am a member of SCBWI and my website is http://www.klcockroft.com. I live by beautiful Puget Sound with three independent daughters, a husband, and a huge, playful puppy! 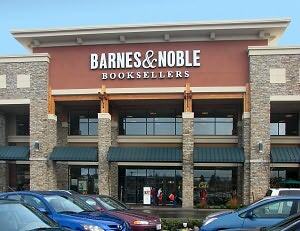 People are often surprised to hear I was born in rural Bangladesh, among green hills and rice paddies. My father was a relief and development worker and his work in a leprosy and TB hospital kept us in Bangladesh for the first six years of my life. We made the startling transition to snowy Illinois, where we lived for a year before moving to Georgia and then to North Carolina (two years in each place). These brief years in the United States instilled in me a love for my beautiful home country. In Cornwall, England, one of my favorite places on earth! Once my father had his PHD in Public Health in hand, we moved to Nairobi, Kenya, where I spent my most formative years. I went to school on a hill surrounded by a coffee plantation, learned how to drive among elephants and ostriches in the game park, and made life-long friends. Growing up in an international community, I gained a deep appreciation for diversity. Too, my childhood was marked by a lack of technology, so I grew up with books and songs and storytelling. I returned again to snowy Illinois, this time for college at Wheaton College, where I majored in Literature and took as many writing classes as I could fit into my schedule. It was there I met my husband, Martin Cockroft, who has not only been my best friend for many years, but also, as a fellow-writer, my faithful and most critical editor. Though I’d always expected to live overseas, I found myself reveling in my own country, a place I had spent relatively little time exploring. We moved to Missoula, Montana (one of my favorite places in the world) where I taught high school English for two years. Then, shortly after our first daughter, Merry Winter, was born, we lived by family in an apartment built onto the side of a barn outside of Houston, TX. 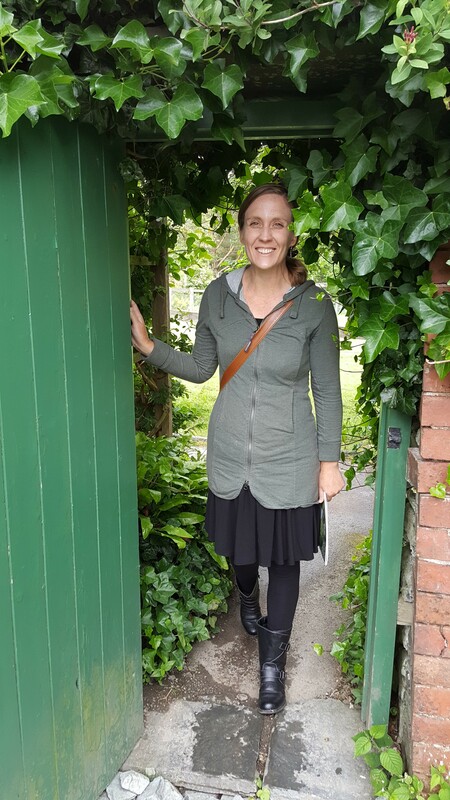 Standing in Beatrix Potter’s garden at Hilltop! We moved back across the country to Iowa where my husband taught college poetry for a year and then finally settled in Waynesburg, Pennsylvania. While my husband taught poetry at our local university, I began writing in earnest. Now a mother of two daughters (Elspeth had arrived), receiving a 2009 grant for fiction from the Pennyslvania Council on the Arts helped me to carve out precious writing time. During those years, my poetry, fiction, and nonfiction was published in a dozen literary magazines (please see resume for full list). One of my short stories was a finalist in Glimmer Train’s award for new authors; another was recognized in StorySouth’s Most Notable Stories of 2011; one of my poems was nominated for a Pushcart Prize. I taught some creative writing classes as an adjunct at our local University and enjoyed leading creative writing workshops and readings in our community. To my surprise, I also found myself working for our local paper as a weekly columnist. This job took me all over our Appalachian county, meeting fascinating people and gathering amazing stories. Our third daughter, Beatrix (named after Beatrix Potter), was born. After seven years, we again moved across the country to join family, this time in the Pacific Northwest. In Poulsbo, Washington, I decided to give my full attention to children’s writing and workshops in elementary schools. Martin and I have presented in Seattle through Writers in the Schools, but mainly I like to focus my attention more locally. In our first year here, we jointly conducted writing and song-writing workshops at our local elementary school. In 2014, we were spotlight authors at Poulsbo Elementary School, visiting all grades over the course of several days. Five of my stories have been published or are forthcoming in award-winning magazines Cricket, Spider, Ladybug and Babybug. All these stories reflect a different and wonderful place I have lived around the world. 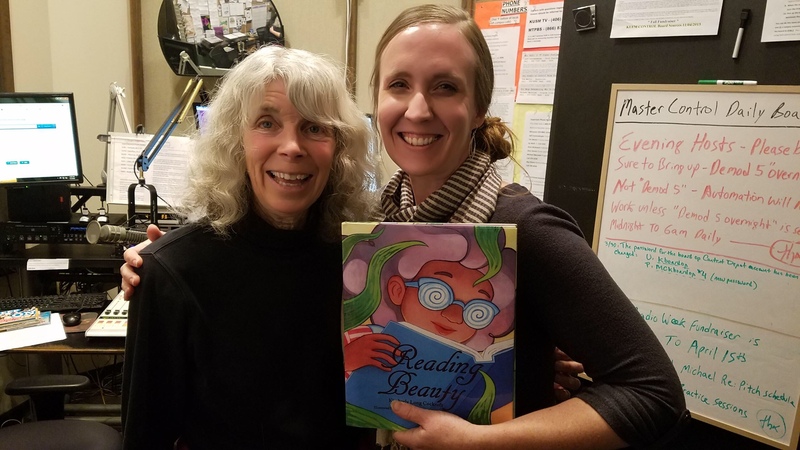 In October 2015, I visited Montana Public Radio’s Pea Green Boat, where I read my story, “Apple Days” and talked about writing and apples. I am currently at work fine-tuning a book for middle readers. I hope the publication of Reading Beauty will lead me into yet more elementary schools so I may join my favorite writers—kids—in the great work of imagination and story-telling. My oldest daughter at one of our favorite places–our local library! I write in a much different capacity for Each Holy Hour, a project for daily wonder that I cofounded with my dear writer-friend, Lindsay Joss Iudicello. Each Holy Hour creates weekly content that seeks to build a community of thoughtful, reflective people who love poetry, art, and seek to ‘call forth [the riches] of daily life,” as Rilke once wrote. I also write meditations, prayers, and liturgy as Artist-in-Residence at our local church. I occasionally freelance for NPOs, keep up a blog about my writing, thoughts, and family (www.wazoogoeswest.blogspot.com), and maintain this website. In my free time, I love dancing, singing, and reading with my three lovely daughters as well as gardening (but not very well) and exploring the Pacific Northwest and beyond with my dear husband. My days are spent writing in our local library or, on rainy days, by our woodstove at home, where our crazy and lovable border-collie/lab, Jemma, keeps me company.